← Let’s Review/Discuss: YouTuber books! HELLO EVERYONE! My name is Harshi. Yes. Like Hershey Bar. Or Hershey kiss. Fun fact: more boys tend to call me Hershey Kiss than do girls. Just an observation. I should probably tell you things about myself now. I’m Indian, a junior at Flower Mound High School, and a MAJOR TV SHOW FAN. I won’t scare you away with my fangirling(yet). Anyways, I have been in TAG for about half a year and love it. Y’all are so sweet! Ummm what else do I need to tell you? I think that’s it. I’m pretty chill about things and open so yeah. I don’t know how to end this post so here! 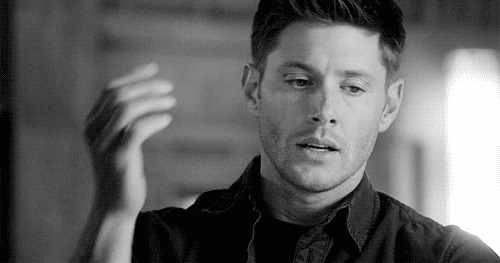 Have some gifs of DEAN Winchester, who is basically me! (I love how DEAN automatically capitalizes).